Mike Remmers gets up hobbling after that sack on Cousins. He's staying in. Vikings catch a break as Trubisky overthrows Robinson with Anthony Harris sitting over the top. Second pick of the night for the safety, and the Vikings have the ball at the Bears' 31. Anthony Harris gets interception No. 2, looking like Trubisky meant to throw it to him. #Vikings start at the Bears' 31-yard line with a chance to make this a game. FLEX ON 'EM, @TarikCohen ! Injury Update: Aaron Lynch has been ruled out of #MINvsCHI with a concussion.
.@SmashAmos38 seals it at 14-0 headed into the half. Through six quarters today, the two participants in the 2018 NFC Championship Game have been outscored 62-7. 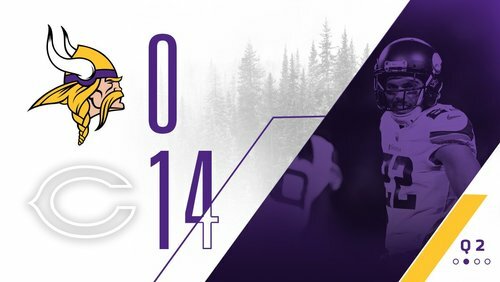 Still plenty of time for the Vikings to turn this around, but the Bears will get the second-half kickoff. Upon further review, I still have no idea whom Kirk Cousins was targeting on that interception. Under pressure by Floyd and he sails an easy turnover. #Vikings down 14-0 after an abysmal showing on offense in the first half. Vikings five possessions in the first half: 3 three-and-outs, two turnovers. And it's all a moot point. Cousins is picked off while throwing for Rudolph under pressure. 23 yards after the catch from Stefon Diggs there. Decision not to go out of bounds cost them a timeout, but also put them in field goal range when Diggs was able to stretch the play. Diggs goes for 25 yards to move the #Vikings inside CHI territory. Parkey puts us up 14-0.
:44 to go in the half. 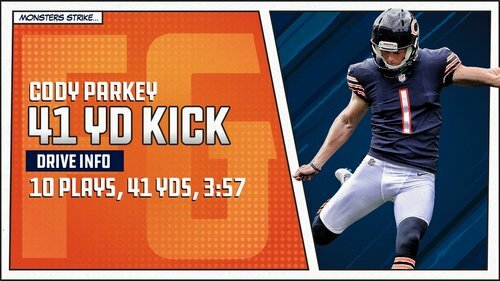 Parkey is good from 41, and the Bears have a 14-0 lead. Going for two added an extra point to their two field goals to make it a two-touchdown game. #Vikings trail 14-0 after Parkey's field goal. The offense, with 1.9 yards per play at this point, has 50 seconds and one timeout. CHI leads 14-0 with 0:50 left in the 1st half. #Vikings ' season-worst rushing defense was 128 yards allowed vs. Bills. 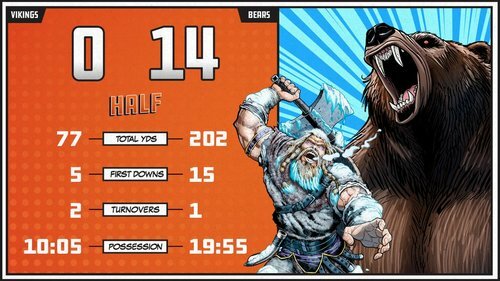 Bears already up to 114 rushing yards in first half. 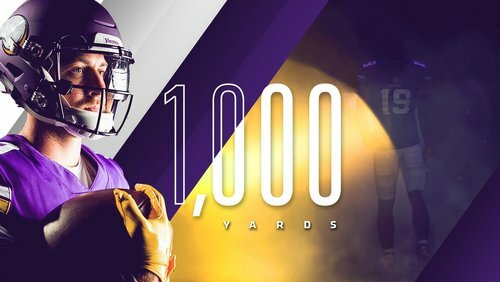 Vikings 0-3 this season when allowing 100-plus on ground. Bears have given the ball to six different ballcarriers on 18 rushing attempts (including scrambles from Trubisky). They've gained 109 yards on the ground with 3:46 to go in the second quarter. Xavier Rhodes is back in the game for the Vikings. Vikings have three three-and-outs, a fumble in the red zone and are averaging 1.9 yards on 18 offensive plays. Khalil Mack has a forced fumble and recovery, two quarterback hits and two pass breakups. #Vikings ' three-and-out counter up to 3 of 4 drives. They haven't been able to block this Bears front tonight. Mack already credited with 2 deflections, 2 hits and the forced fumble. Looks like it. He's still on the sideline with the defense. Bears cut right through the #Vikings ' red-zone defense on that drive. Deficit 11-0 after a 13-play, 82-yard scoring drive (52 yards rushing). 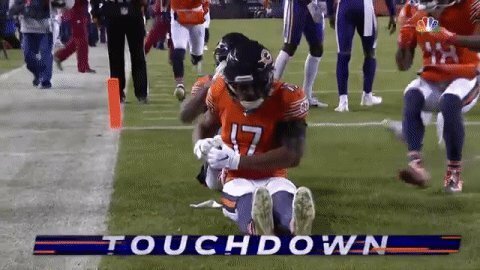 Bears had run, or Trubisky had scrambled, on seven straight plays before the touchdown throw to Miller. 13 plays for 82 yards in 7:13 on the scoring drive. CHI takes an 11-0 lead with 6:00 left in the 2nd quarter. 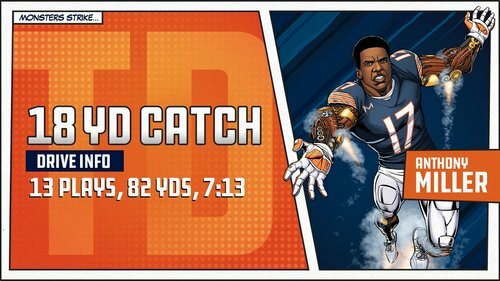 And Trubisky finds Miller for a TD vs. Hill, who was in for Rhodes (limped off). #Vikings about to trail 10-0 pending PAT. Bears just topped 100 yards rushing midway through the second quarter. Bears are running by Everson Griffen on this series. Howard picks up 8 (looked like Griffen was held) and then Trubisky gets by him on keeper. Bears now have 100 rushing yards with 6:27 before halftime. Bears have held the ball for more than 14 of the game's first 23 minutes. 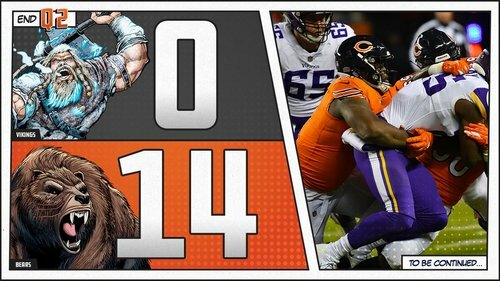 Mitchell Trubisky dodges every #Vikings defensive lineman on back-to-back scrambles, leads Bears with 28 rushing yards. On both of Kirk Cousins' incompletions on that drive, he had Khalil Mack bearing down on him after turning the corner on Riley Reiff. Khalil Mack was close to getting Kirk Cousins on his first pass of the drive. He got to him on the last one... #Vikings to punt. Great play from Anthony Harris to pick off Trubisky after the QB tried to fit a downfield throw for Taylor Gabriel into a window with three defenders nearby, including two safeties over the top. Vikings take over on their own 32.